There was a lot of interest in coronary CAT scans when they first became available five or six years ago. It was exciting to be able to directly vizualize the arteries in patients who were thougth to be at increased risk of heart disease. If detected early, the disease could be treated to prevent heart attacks. According to this recent article, early detection doesn’t necessarily affect outcomes. Screening patients for heart disease with a heart-imaging test prompted greater follow-up care but had little to no effect on the number of heart attacks and other cardiovascular events in those patients, a new study found. Prostate cancer: Measuring levels of prostate-specific antigen, or PSA, has been shown to detect early-stage cancer in men. But prostate cancer progresses slowly in many cases, and potentially it can be left untreated. The American Cancer Society’s 2010 guidelines recommend against routine testing for prostate cancer. The group said men should discuss PSA testing’s ‘potential benefits and limitations’ with their physician. Breast cancer: In 2009, the U.S. Preventive Services Task Force made the controversial recommendation that most women should start getting mammograms at age 50 rather than age 40, unless they are considered at high risk of developing cancer. It also said most women from ages 50 to 74 could undergo a mammogram every two years rather than annually. The American Cancer Society disagrees and continues to recommend annual mammograms for women age 40 and older. Colon cancer: American Cancer Society guidelines recommend periodic screening in people age 50- plus, including a colonoscopy every 10 years. In 2008, guidelines were updated to include a less-invasive ‘virtual’ colonoscopy, using CT scans and no sedation, every five years. Researchers at Johns Hopkins Hospital in Baltimore led the study, which was published online Monday in the Archives of Internal Medicine. 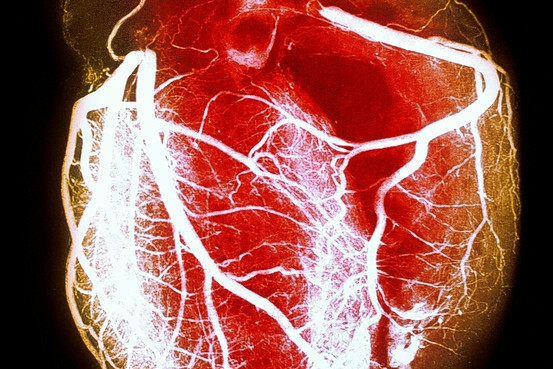 John McEvoy, a heart specialist at Johns Hopkins Hospital and the lead author, said doctors are looking for “optimum use” of a non-invasive imaging test called coronary computed tomographic angiography, called a CCTA test and also known as CT angiography. Researchers wanted to know whether finding plaque buildup at an early stage slows the progression of heart disease and reduce heart attacks in patients who aren’t showing symptoms of heart disease. The study of CCTA screening comes as medical experts are re-evaluating the frequency and usefulness of other types of health screening, including mammographies for women and PSA testing for prostate cancer in men. The CCTA test isn’t currently a common screening test for heart disease, and American Heart Association guidelines recommend against such use of it. Still, Dr. Lauer said such use is likely to grow. The test costs from $600 to $1,000 per patient, researchers say. Dr. Lauer said the heart, lung and blood institute is funding separate studies of CCTA involving patients with chest pain and other symptoms of heart disease to better define how to use the test. For now, most doctors assess risk for coronary heart disease using blood tests to measure cholesterol and other fats in the blood, and then in some cases prescribe medication to lower cholesterol. Imaging tests often are reserved for patients with chest pain or other heart-disease signs. 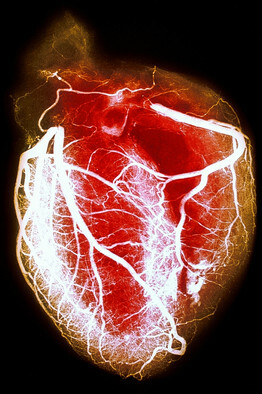 In a CCTA test, patients are injected with dye and then undergo a scan, which creates three-dimensional images of the heart and blood vessels. The images show plaque and other deposits that often build up inside blood vessels and can lead to heart attacks and other cardiovascular problems. The test differs from a coronary angiogram or a cardiac catheterization, in which a catheter is inserted into a blood vessel in the arm or leg and then guided into the heart to look for blockages or narrowing of blood vessels. In contrast, the CCTA scan isn’t invasive, and for that reason some medical experts say it has potential to be widely used for screening healthy patients for heart disease. Some anecdotal evidence suggests such screening is happening and becoming more common. The researchers looked at patients who weren’t considered high risk but did exhibit some risk factors for heart disease. Almost all adults over age 50 likely have some plaque in their arteries, he said. The study involved 2,000 patients in South Korea with an average age of 50 taking part in a health-screening program. The study compared 1,000 individuals who underwent a CCTA exam with 1,000 who didn’t undergo the test. It found 215 patients who underwent the exam had a positive result, meaning they were found to have plaque in their blood vessels. These patients were 10 times as likely to have been sent for an exercise stress test, a nuclear medicine scan or a cardiac catheterization as patients who didn’t have the CCTA test. The patients also were three times as likely to be taking a statin medication, and four times as likely to be on aspirin therapy, both designed to lower risk of heart attack. After 18 months, the study showed, one person in the CCTA group developed a heart problem known as unstable angina and one person in the non-testing group had a fatal heart attack. Patients would have to be followed for a longer period to look at whether there’s a true difference in heart events and heart-related deaths between the two groups, Dr. McEvoy said. The CAT scans are not without risk. There is significant radiation exposure and often abnormalities of uncertain significance (“incidentalomas”) are detected which may prompt further scans and biopsies which may actually put the patient at risk. The following is a blogpost on the CDC’s blog which got a lot of publicity. It was a tongue in cheek plan the was meant to bring attention to emergency preparedness and the CDC’s response to epidemics. This deals with a hypothetical Zombie epidemic. My patients are usually receptive to having medical students in the office. The students seem to enjoy the experience. Whether these rotations encourage students to go into Internal Medicine is unknown. The following article from The ACP Observer suggests that it does not. Sigh. comparison of students in 1990 and 2007.
clerkship experiences and perceptions of internal medicine careers. Results appeared in the April 25 Archives of Internal Medicine. (response rate, 75%) and 1,177 students at 11 schools in 2007 (82%). internal medicine more attractive (19% vs. 24%, P<0.001). Educational loans were a deterrent for more students in 2007 (26% vs.
slowing the “treadmill” pace by replacing fee-for-service reimbursement. On a positive note, I received an email from a fourth year medical student who had spent a month in the practice last year. He matched in an Internal Medicine residency at the UTHSCSA.